At first glance, you would not think that a square of thin cotton cloth would be all that useful. 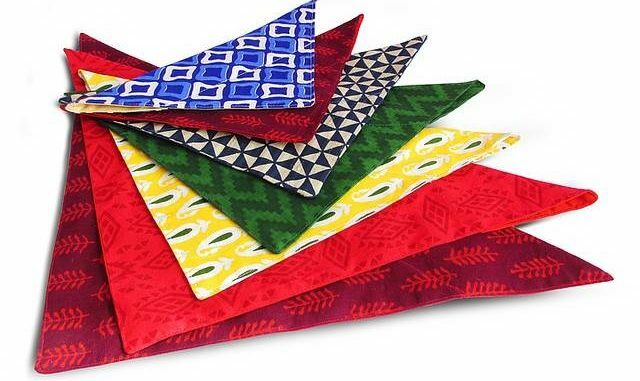 However, the humble bandana is one of the most useful tools you can have in a survival situation. Its simplicity makes it more versatile than just about anything you can bring with you. I personally opt for the lightly larger shemagh, but it is exactly the same principle. For centuries everyone from Wild West cowboys to special-forces soldiers in Afghanistan have kept this cloth with them. In this article I will cover all the different ways you can use your bandana in a survival situation. There are several places you should keep a bandana for easy access if you need it. I actually suggest keeping one on you at all times in your everyday carry kit. You can also keep one in your bug out bag, your get home bag, and in the trunk of your car. The point is that no matter what happens, a bandana is important enough to always have access to one. During my very first survival challenge, I split my head open on a low-hanging branch. It was bleeding pretty badly and I knew I had to get pressure on it, but I did not have a bandana with me. I ended up cutting off both sleeves of my shirt as well as the pockets of my pants to keep a clean bandage on it. It was not really an ideal situation. I want to break down the uses for this cloth into the four pillars of survival along with a few other important categories. This would include food, water, fire, shelter, first aid, signaling, and self-defense. Collecting wild edibles – When you are gathering wild edibles, you want to have them in a soft enclosure that gets plenty of air. This will keep leafy greens from wilting and berries from getting smashed. Loading up your bandana with edibles and tying it into a bundle is a great way to keep them fresh on the trek back to camp. Go spit fishing – If you want to collect minnows for bait or for a snack, you will need a makeshift net. Use a thin green branch to create a loop at the end of a handle and tie your bandana onto it forming a net. Submerge the net just below the surface of the water and spit into the water above it. The saliva will attract the minnows. Then you just lift it out of the water and fish out the minnows. Make a bear bag – if you have a kill large enough to save some meat for the following day, predators will be an issue. Bears in particular will rip apart a camp to find meat. Bundle your food up in the bandana and tie cordage to it. Throw the other end over a tall branch and pull up the bundle so it is at least 10 feet off the ground. Make sure you do this at least 100 yards from your camp and you should be able to sleep knowing your breakfast is waiting. Keep your fish fresh – If you have caught a few fish and have them on a stinger in the water, they can stay alive for several hours. However, there is a good chance that a scavenger will snag your catch, especially at night. You can loosely tie your bandana around the fish and place them back in the water. This will at least protect from small animals that may try to snag your meal. Make yourself a soothing tea – If it is cold and your body is stressed, a tea can be a nice way to boost your health and your spirits. You can make a tea with pine or spruce needles, berries, or other wild edibles. Place a handful of your plant material into the bandana and tie it into a bundle. Smash it against a rock or stomp it with your boot to break up the plants and release the juices. Boil a pot of water and drop in your bundle. After a few minutes the healing and tasty properties of your plants will seep into the water. Many of these plants have vitamins and healing capabilities, so it can be very beneficial. Crack some nuts – There are often trees that produce nuts filled with protein in your area, but the shell is sometimes difficult. If you smash it on a rock, there is the chance that your food could shoot all over the place. Wrap your nuts in a bandana before smashing them to hold all the pieces together. Make a water filter – In any water filter you need a layer to remove small debris. A bandana is the perfect thickness for this. If you have a bottle or other container, you can add gravel, sand, and charcoal. Then put the bandana over the mouth to filter out the larger debris. Collect dew for a drink – Morning dew is one of the most pure forms of water you can find in the wilderness. However, the only good way to collect dew is with fabric. If you wrap a bandana around your pant leg and walk through tall wet grass, it will collect the dew. You can then ring it out for a drink of clean water. Make dry tinder – Cotton makes an excellent tinder when it is shredded and fluffed up. You can fray a bandana down to fibers and then fluff it up enough to take a spark. It works even better if you can rub a little Vaseline or chapstick on it. Make char-cloth – This finished product is one of the few types of tinder that will both take a spark and light under a lens in almost any situation. To make char-cloth you must have a small tin like an Altoids can. Punch a tiny hole in the tin and cut up your bandana into one inch squares. Load up the tin and throw it in the fire for 10 to 20 minutes. The finished product should be completely black meaning all impurities have burned off. Keep your finished product dry and add it to all future tinder bundles. Make cordage for a bow drill – You can cut your bandana into strips and weave it together to make strong cordage. It can then be tied to a bow stick and used for a bow drill set to make friction fire. Make a wick for an oil lamp – There are several ways to make an oil lamp with found fuels and containers. However, they all need a good wick. Soak a thin strip of your bandana in your fuel, put one end in the reservoir, and light the other end. It should burn until the fuel runs out. Head and face coverage – If you need to protect yourself from the sun, wind, dust, rain, or cold, a bandana can help you. You can use it to cover your head, face, or mouth to filter out the elements. I completed a lifeboat challenge in scorching temperatures with only a bandana to cover my head. It works. Cordage – One of the main necessities of shelter building is cordage. If you cut a bandana into strips you can use them as cordage or weave them to make even stronger cordage. Make a pillow – When you are in a survival situation, any little bit of comfort can help. Having a soft surface on which to lay your head can greatly help your ability to sleep. If you roll your bandana loosely it makes for a nice pillow to insulate your head from the ground. Stop Bleeding – When you have a deep cut you need to apply pressure with a bandage to stop the bleeding. This bandage needs to be clean, so a bandana is a good option. Tie the bandana tightly on the cut and change it regularly if possible. Reduce fever – If you have a fever it is important to get your body temperature down. This is also true for hyperthermia or heat stroke. If you need to reduce your body temperature, you can dip your bandana in cold water and wrap it around your neck. This will affect the blood in your jugular veins and help with fever or hyperthermia. Aid with hypothermia – When your body temperature is too cold you need to warm your core as quickly as possible. Dipping your bandana in boiling water and rubbing it on your chest or neck can help you turn the tide. Protect burns – Any burn needs to be protected from the elements to heal properly. A bandana is the ideal bandage to wrap around a burn. Heal skin irritation – When you have poison ivy or another skin irritation, it is important to keep it clean. If you have an ointment, that works even better. Either way, keeping it wrapped in a bandana is a good idea. Make a tourniquet – If you have severed an artery and are worried about bleeding out, a tourniquet may be your only option. Tie your bandana around the severed limb above the cut and put a stick inside the wrap. Twist it until the bleeding stops and hold it in place. Be aware that this is a live saving technique and could cause the loss of a limb. Make a splint – If you have broken a limb and need a splint, you will need to secure the limb to something sturdy. Find some sticks of the right length and use pieces of the bandana to tie your limb to the sticks. This will hold it in place until you can get to help. Slow the effects of venom – If you have been bitten by a venomous snake, you want to keep the venom away from your heart. There is not much you can do short of getting to a hospital with anti-venom, but you can slow the spread. Tie your bandana around the limb that has been bitten and above the bite to slow the blood flow. Then get to help as quickly as possible. Make a sling for an injured arm – When your arm needs support, a bandana can be wrapped around your neck and can make for a good support. Protect your hands – There are times you need to handle something hot or something sharp. A bandana makes for a good option to protect your hands from dangers like these. Protect your fists – If you know you are going to get into a confrontation, keeping your hands protected is vital. Most people do not keep leather gloves with them, so a bandana is a good option for your dominant hand. It can keep your knuckles from splitting open and allow you to win the dispute. Choke out the attacker – When you know you need to disable your attacker to get away, putting them to sleep may be your best option. A good way to do this is to apply pressure to both corroded arteries as well as their wind pipe. Gripping a bandana tightly and applying pressure to the neck is a good way to do this. Conceal your identity – When in a survival situation, concealing your identity can be vital. Having a bandana over your face works incredibly well to keep your identity hidden. Flagging – Getting the attention of rescue personnel is tough with just a bandana. However, movement is helpful. If you tie a bandana to a long stick and wave it in the air, it can make a good ground to air signal. Smoke signals – You need to have a blanket of sorts to help create intervals for smoke signals. A bandana is a great way to separate your ‘S’s from your ‘O’s when signaling ‘SOS’. Make a sweatband – It does not really fall into any of these categories, but this is the way I use my bandana most. When I am hiking or hunting I sweat a great deal. Just wearing a hat does not keep the sweat out of my eyes. However, if I roll up my bandana and tie it around my head, it catches most of the sweat. Then I just ring it out periodically, and I can see well all day. I know this may seem like a huge number of uses for one item, but just take one with you. Keep a bandana in your pocket every time you enter the wilderness and remember the uses I have mentioned. As you keep this tool on your mind, you will start to use it more and more. Anymore I will not hike, fish, hunt, or take on a survival challenge without at least one bandana in my pack. If it is good enough for special-forces, it is good enough for me. Spend a few bucks and pick up some bandanas. I am sure you will end up using them just as much as I do. One other self defense application for a bandanna is an old biker weapon, where you loop the bandanna through the hasp of a padlock and use it as an improvised mace. Taking a swinging padlock to the head can be pretty devastating, and carrying a bandanna and a padlock in a backpack or vehicle won’t draw much scrutiny by the authorities or even airport security.